MORENO VALLEY, Calif. – The Bureau of Land Management (BLM) has scheduled activities associated with the reopening of its Desert Discovery Center (DDC) upon completion of renovations that began last fall. While finishing touches are taking place inside, the DDC school programs have already started and the center will reopen to the public on Tuesday, February 28. The public is encouraged to visit the center from 11 a.m. to 4 p.m., Tuesday to Saturday. A grand reopening celebration will take place on Earth Day, Saturday, April 22. 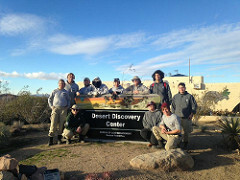 Programs and activities at the DDC this year will focus on "Discovering the Desert." Constructed in 1973 and home to the "Old Woman Meteorite," the DDC serves as an environmental education center for the surrounding high-desert communities. The DDC is comprised of a unique partnership between several government, education, and non-profit organizations originally established in 2000. Partners work collaboratively to provide environmental education, contribute funding for facility operations, write grant applications, prepare interpretive displays, create public art and promote the DDC. The center's renovation, started in October 2016, includes a new roof and several interior upgrades, including a classroom makeover and expansion. For more information, please call Zachary Pratt at (760) 252-6040.